Join Us!!! 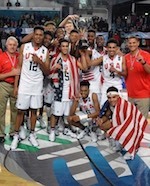 We are looking for someone to help us cover Tournament Of The Americas U18 basketball. Please send us an e-mail. 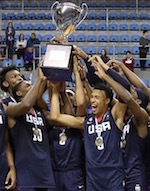 USA celebrated Gold in Formosa. They beat Canada in the championship game. Vernon Carey (204-C-01) banked in 19 points to pace the winners. USA dominated from start to finish. They grabbed a comfortable 49:24 halftime lead. USA unleashed 62 points in the second half to cruise to the victory. DeVion Harmon, Jeremy Roach (186-G-01) and Jalen Green (196-G-02) delivered 13 points each for the winners. Luka Sakota (185-PG-01) responded with 17 points for Canada. Puerto Rico claimed the third position at the championship. They outgunned hosting Argentina to step onto the pedestal. Andre Curbelo (185-PG-01) posted 23 points and 6 steals to lead the charge. Puerto Rico piled up a comfortable 44:28 halftime lead. Argentina narrowed the deficit in the second half but could not avoid the loss. Victor Rosa (195-SF-01) provided 19 points in the win. Bautista Lugarini (199-F-01) responded with 18 points for Argentina. Dominican Republic finished fifth at the tournament. They wrapped up their campaign with a comfortable win over Mexico. David Jones (193-F/G-01) delivered 22 points and 10 rebounds in the win. Dominican Republic piled up a 37:24 halftime lead. They poured in 34 points in the second half to ice the win. Jean Montero (185-G-03) tossed in 15 points in the victory. Ivan Cruz (187-PF-01) responded with 17 points for Mexico. Venezuela finished their campaign in Formosa on a high note. They beat Paraguay to end up in the seventh place. Enderson Alcala (191-C-01) tallied 18 points and 10 rebounds to lead the winners. Paraguay posted a 28:21 halftime lead. However Venezuela bounced back with a 16:4 rally in the fourth frame to seal the victory. Jose Meneses (180-G-01) chipped in 17 points for the winners. Jose Barreto (185-F-01) responded with 20 points for Paraguay. USA breezed past Argentina en route to the championship game. Scott Barnes (200-SG-01) produced 20 points and 6 steals to pace the North American side. USA led from start to finish. They erupted for massive 71 points in the first half and secured an unassailable 50-point lead. USA cruised to the victory after the long break. Romeo Weems (195-F-01) delivered 17 points and 7 rebounds in the win. Bautista Lugarini (199-F-01) responded with 15 points for Argentina. Canada outscored Puerto Rico to advance into Final in Formosa. Cashius Mcneilly (185-SG-01) stepped up with 23 points and 9 boards for the winners. Canada dominated in the first half. They poured in 46 points to take a 17-point halftime lead. Puerto Rico slowed their opponents down in the second half but could not overcome the deficit and had to surrender at the end. Shemar Rathan-Mayes (178-G-01) tossed in 14 points for the winners. Andre Curbelo (185-PG-01) responded with game-high 27 points and 9 boards for Puerto Rico. Mexico outgunned Paraguay in the classification round. Gibran Avelino (192-PG-01) provided 19 points for the winning side. Paraguay grabbed a 16:13 lead after ten minutes. Mexico however erased the deficit and pulled ahead for a 31:25 halftime lead. Mexico added 25 points in the fourth term and sealed the victory. Ivan Cruz (187-PF-01) delivered 14 points for the winners. Fabricio Ruiz (187-G-02) responded with 13 points for Paraguay. Dominican Republic outgunned Venezuela in the classification round. David Jones (193-F/G-01) posted 14 points to lead the winners. Dominican Republic piled up a 31:18 halftime lead. Venezuela pulled within 7 points at the final intermission however Dominican Republic responded with a 30-point effort in the fourth term and sealed the win. Malvin Payero (182-PG-01) provided 12 points in the victory. Enderson Alcala (191-C-01) responded with 15 points and 7 rebounds for Venezuela.